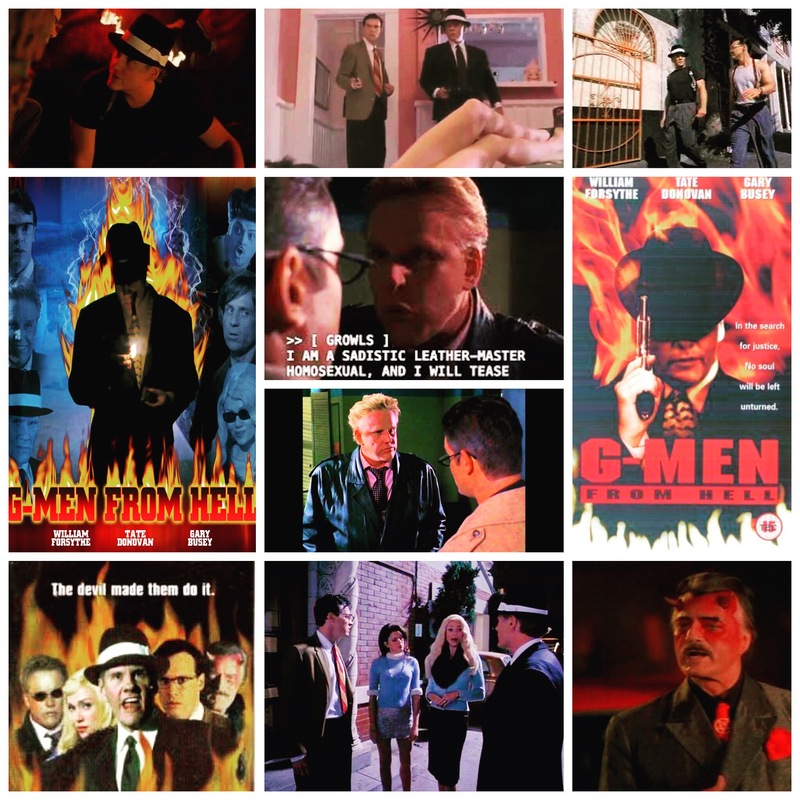 G-Men From Hell is.. well, pretty much exactly what the title suggests. Based on a comic book, I think, it concerns two melodramatic 1950’s FBI Agents named Dean Crept (William Forsythe) and Mike Mattress (Tate Donovan) who are gunned down by mysterious assailants, and sent off to the inferno to rot, only they aren’t finished their business earth-side, and escape using some magic dimension opening crystal. Once back in the realm of the living, they set up their own private detective agency, forced to keep up their good deed quota in order to prevent from being dragged off again. The Devil (Robert Goulet, hilarious) is furious and dispatches an agent of his own to retrieve them. Meanwhile, a relentless and fairly nutty police detective (Gary Buddy) is also hot on their trail. Busey, as usual, flips the script into the dustbin and does his own warped thing with the dialogue, making scene partners visibly try to hold in laughter and bewilderment, proving once again that any film he appears in will never get boring. Forsythe and Donovan play it like Looney Toons in noir mode, two campy gumshoe performances that are so knowingly tongue in cheek that it almost seems like a stage play. Cameos include Bobcat Goldthwait, David Huddleston, Kari Wuhrur, Charles Fleischer, Frank McCrae and Vanessa Angel. I feel like the whole thing is just a bit silly to work, even as one big riotous in-joke, but it’s a colourful diversion nonetheless, and any film with that title deserves a watch as an ode to it’s sheer commitment to blatant inanities. Please excuse the pitiful lack of high def photos in my collage, whoever was in charge of screen caps and production stills on this should be shot in the face.